We decided to take the Trade In to Ocean City, MD so we could be in range for the yellowfin tuna bite that has been red hot. I moved the boat Friday, and Maureen wanted to look for white marlin on Saturday, then we were planning to go for tunas for the remainder of our days in OCMD. Anyway, we decided to try the filament of blue water that had pushed in and was now just below the Baltimore Canyon. We got there after getting beat up by a stiff head sea the last 15 miles and started trolling. We found the break in 70 fathoms and bounced around on the bank with no bites. We pushed back in and followed the 2 degree break (72-74 degrees) and color change (blue to blue-green) and had lots of birds wheeling around but no bites. With the choppy seas we put the Trade In down sea towards home and once we had a pair of whites pop up and eat, but neither connected unfortunately. That was all we had to our day. 6/22 – We woke up this morning and debated over whether to sit out the weather in Ocean City, MD and hope we would get a break, or run the boat back home instead of wasting time and money. We chose to do the latter, so our plans for line class fishing for the yellowfins will just have to wait until something materializes closer to home. I captained the 52′ Ocean Yacht ‘Saltitude’ for the Challenge Cup. We had fished our way down Wednesday and spent Thursday prepping tackle. The ended up canceling Friday and made it a Sat-Sun tournament, but we went on Friday anyway since we were all set to go. We went to the West Wall of the Baltimore and worked our way down towards the SW Corner and finally found the water we were looking for at the end of the day. We missed one early, then saw 3 more at the end of the day. We ended up going 1/2 and raised 4 whites. The wind came up hard out of the NW and the first half of our ride home was pretty rough, but is flattened out once we got inside. Saturday we ran to the NE corner of the Washington Canyon. The NW wind was blowing a stiff 15-20 all morning and made fishing a little tough. We were 0/2 in the morning. We kept pounding it out and from 2:00-3:30 we raised 7 whites and a blue marlin. Only 2 of the whites tried to eat and we ended up 0/4 raising 9 whites and a blue. It was a frustrating day as we had a lot of weird things go wrong throughout the day. It was like we just were not meant to catch a fish Saturday. Sunday we ran into the Southern Rockpiles below the South Poormans Canyon in 50 fathoms. There was a large presence of little bonita there throughout the day. We ended up going 1/5 and raised 8 white marlin all in an hour late in the morning. The rest of the day was a struggle to find another bite and we did not succeed. All in all, it was a great weekend, we got plenty of shots, and everyone on the boat is learning what to do in certain scenarios. Soon we will be on point and racking up the numbers on Saltitude. I ran the the 54′ Ocean Fin Addict today. We threw this trip together last minute and headed out looking for white marlin. We started inshore of the Baltimor in 50-80 fathoms and worked the small weedline there. We picked at some magi, had a wahoo bite us off, and got into a few white marlin. We were 1/4 by noon on whites. Mid day was slow fishing so we made a move to the SW corner of the Baltimore. We finally got into a few fish on the teasers but they wouldnt fully commit. Finally we got a bite out of one more and wound up getting 2 whites for the day. Ran out on the Boss Lady with plans for an overnighter. Weather was looking great other than a slight breeze stirring up some chop out of the North, but plenty comfortable on the 50′ East Bay. We got to the canyon with high hopes since a new piece of water moved into their according to the satellite images we saw from Roff’s. As we hit the West Wall we hit the edge of the water and it went up to 77.3 degrees and blue. We had lines in at 4:15 and around 4:40 FISH ON! The center rigger went down (black/purple 8 oz Joe Shute with a medium ballyhoo) then the two long rigger dink baits on circle hooks were hooked up along with some other bites . We ended up pulling one off, got one in after 25 minutes and then right next to the boat we wound up having the hook break on us. Kind of bittersweet, but after seeing the bigeyes were there we made a few changes to our spread. After that melee, we got back on the troll and started looking for them again. After about 20 minutes, Captain Bill May said, “They are under the boat at 100 feet.” Ten seconds later there were explosions behind every bait. It was insanity, We ended up having 6 come tight. One pulled off on the initial run, and we lost another as the line went slack on the angler and the bigeye threw the hook. After that, we were able to manage getting all four in the boat. We had one straight up and down and the reel cracked, so we had to handline it in the last 50 feet which was wild. Right at the surface the leader parted and Joe managed to get a gaff in it before it sank to the depths. We had the last of the 4 bigeyes in just after sunset, which Bill fought to the end. 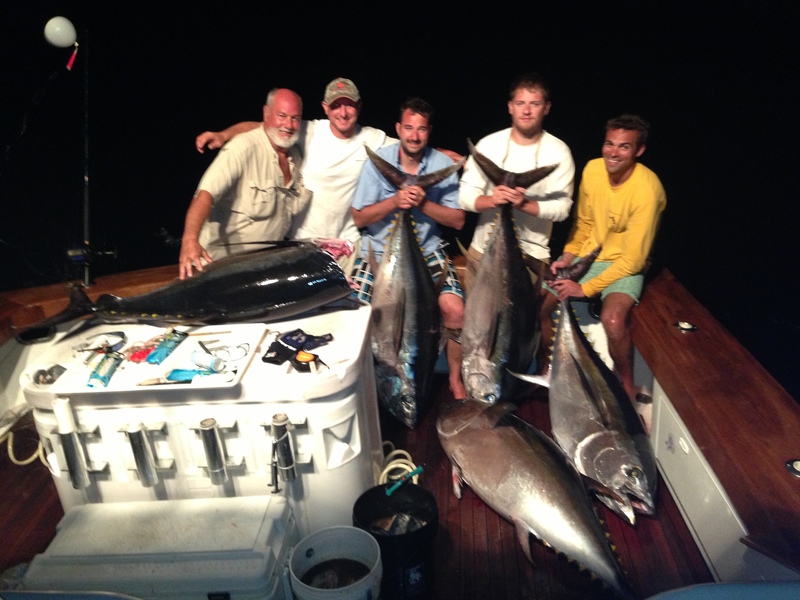 With everyone stoked and the boxes full of bigeye tuna iced down nice, we started our way back in to Avalon. AMAZING trip! I hope I get to see that again in my lifetime, because it was absolutely incredible watching those 200 pound tunas crashing our baits behind the boat. Thanks to Todd, Bob, Bill, Andy, and Ben for being part of yet again another epic trip with us on the Boss Lady! Ran out on the Trade In on Tuesday and headed for the East Notch of the Wilmington to see if we could get a bigeye bite in the first few hours of daylight. Found the whales, but no bites. After that we picked up and ran SW 15 miles until I found the edge of the water I fished in over the weekend. It was blue and 76.4 degrees. We got beat up pretty good with a stiff 15 knot SW and a 4 foot S swell, but we managed to raise some whites and got a bite from a blue marlin. Needless to say, we were way off of our game and only managed to hook up one white. All of our bites were before noon and it shut down after that.